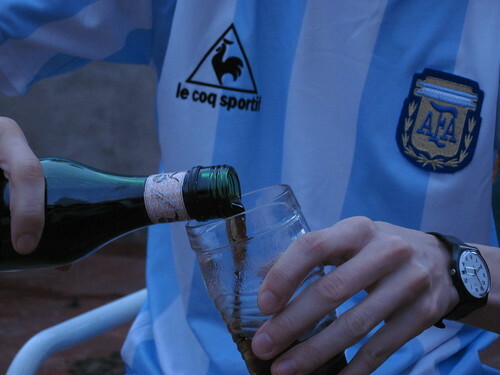 The twenty-seventh episode of Hand Of Pod is our look back on an eventful and historic Copa América Argentina 2011, and Sam, Australian Dan, English Dan and Seba are joined by award-winning author, journalist and editor and co-founder of The Blizzard, Jonathan Wilson, who shares his thoughts on the tournament with us over some fernet and empanadas. Jonathan gives us a tactical breakdown of why Brazil’s defence isn’t what it once was, why Argentina will never be able to replicate Barcelona, and we discuss the importance of silly hair to the Argentine footballing psyche. There are players of the tournament, praise for Uruguay and their brilliant manager Óscar Washington Tabárez, and Mister Wilson’s thoughts prior to the World Youth Cup, which he’s since travelled on to Colombia to cover. And of course, we kick it all of by discussing the AFA’s frankly ludicrous plans for the Primera División. We couldn’t ignore that.